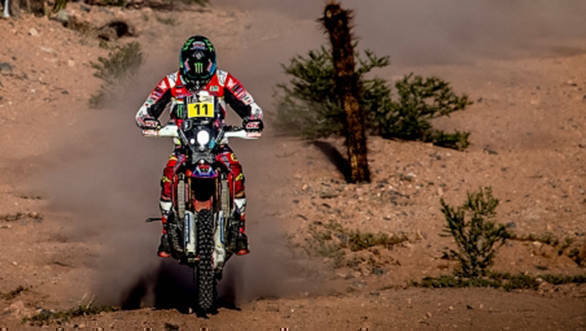 Stage 3 of the 2017 Dakar Rally proved to be a very tricky one for both, the experienced competitors and the rookies. The initial 75km of the stage proved to be a navigational nightmare, with a lot of the participants losing their way. This includes defending-champion, Toby Price of Red Bull KTM, who lost around 20 minutes to Team Honda Racing's Joan Barreda Bort in this section. 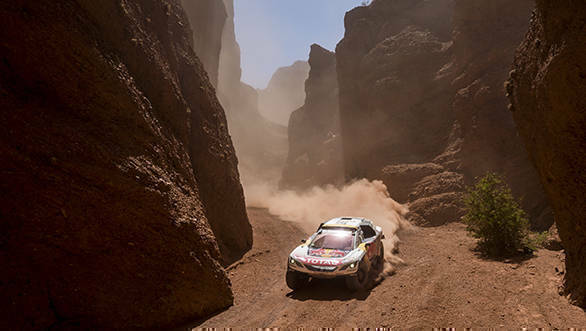 He finished the stage in 4hr45m32s to take 9th place, pushing him down from 1st to 5th in the overall standings. Bort meanwhile, won the stage with a lead of 12m19s, ahead of Red Bull KTM's Sam Sunderland, and took the overall lead. Pierre Alexandre Renet, took 3rd in the stage with a time of 4hr39m11s. Sunderland now stands at 2nd place in the overall standings, 10m20s seconds behind Bort, while Team Honda Racing's Paulo Goncalves is 3m22s behind him at 3rd. In the car category, defending champion Stephane Peterhansel won Stage 3 with a time of 4hr18m17s, while team-mate Carlos Sainz finished 1m54s behind him to take second. This bumped Peterhansel's position in the overall standings to third place. Sebastien Loeb, who finished third with 4hr21m25s on the clock, still leads overall, while Sainz is just 42s behind him. This means Team Peugeot Total now holds 1-2-3 position in the overall standings. Toyota Gazoo Racing's Nasser Al-Attiyah however, had an unfortunate day when his car suffered a mechanical issue. He was initially leading the stage, until he hit a hole and broke the rear right wheel of his car. He managed to nurse the car to the finish line, by which point, he lost 2hr17m to Peterhansel. He now stands 25th in the overall category, 2hr14m58s behind Loeb. The Quad category saw Gaston Gonzalez take a victory in this stage with a time of 5hr58m39s, while Ignacio Casale and Josef Machacek finished second and third, respectively. Casale now leads the overall Quad category 4m37s ahead of Gonzalez, while Pablo Copetti is third. Eduard Nikolaev, driving for Team Kamaz Master in the Truck category, managed the quickest time in this stage with 2hr45m51s on the clock, giving him the overall lead. Martin Kolomy who finished 3m48s behind him, is second in the overall category. Federico Villagra of Team De Rooy Iveco is trailing 4m07s behind Kolomy, after claiming third place in the stage.